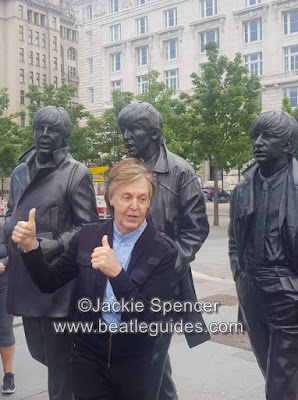 I am sure many of you are like me and have been to Liverpool and went on a Beatles tour. If you haven't had the good fortune of doing that, it is something that is on your bucket list. And if you have gone or will be going, you MUST book a tour with the best tour guide in Liverpool, Jackie Spencer. I have told you all about Jackie before. She is the greatest because she is a real, true Beatles fan. George is her favorite. There is nothing better than going a Beatles tour with someone that loves the band as much as you do. Part of the tour includes going down to the dock and seeing the extra large Beatles statue. No one ever thinks they will meet a Beatle on a Beatles tour in Liverpool. 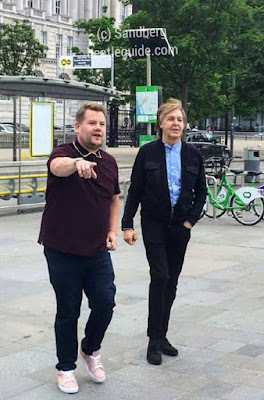 But it never hurts to daydream about it That dream came true to the wonderful fans that were on Jackie's tour the day Paul and James Corden came into town. They just happened to have been at the Beatles statues at the right time. I asked them to share a little bit about what they saw and thought while it all went down. My initial thought when he hopped out of the car was that I couldn’t believe it and it took my breath away. This can’t be happening I said to myself several times. Our hearts and minds were completely immersed in Beatlemania having just done Jackie’s tour. 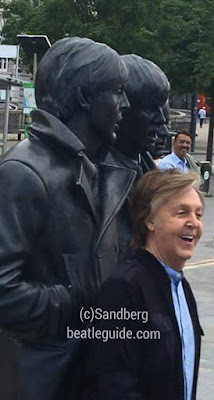 Then to be standing at the statue of them leaving, and we were leaving, up walks Sir Paul larger than life! I thought wow! What a fulfilling moment. It was unbelievable that he was there in his home town and so cool to be seeing him there in his home town! We also felt like “somebody spoke and” we “went into a dream”! !